Proprietary Name: Babyo2 What is the Proprietary Name? Non-Proprietary Name: Colloidal Silver And Glycerin What is the Non-Proprietary Name? Babyo2 with NDC 72136-005 is a a human over the counter drug product labeled by Oxigenesis, Inc.. 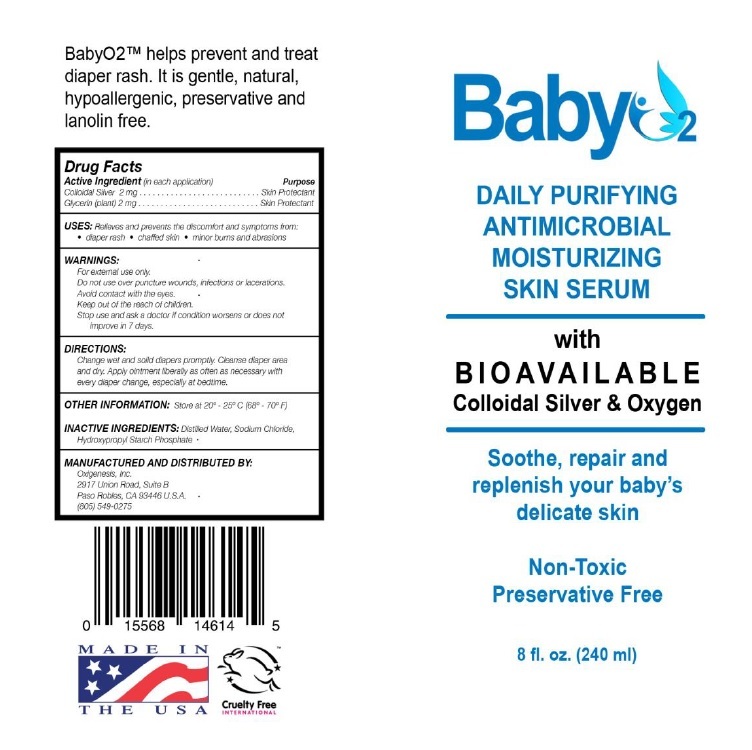 The generic name of Babyo2 is colloidal silver and glycerin. The product's dosage form is solution and is administered via topical form. ﻿UsesRelieves and prevents the discomfort and symptoms from: diaper rash, chaffed skin, minor burns and abrasions. ﻿WarningsFor external use only.Do not use over puncture wounds, infections or lacerations.Avoid contact with the eyes. Stop use and ask a doctor if condition worsens or does not improve in 7 days. ﻿DirectionsChange wet and solid diapers promptly. Cleanse diaper area and dry. Apply ointment liberally as often necessary with every diaper change, especially at bedtime. ﻿Inactive ingredientsDistilled water﻿, Sodium Chloride, Hydroxypropyl Starch Phosphate.